Iolani Luahine turns one year old, 1916. 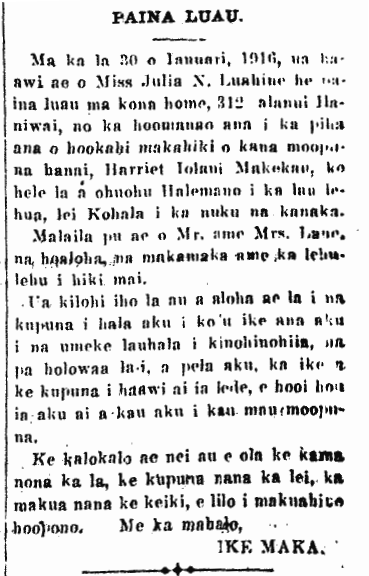 On January 30, 1916, Miss Julia N. Luahine gave a party at her home on 312 Ilaniwai Street, to celebrate the first birthday of her hanai granddaughter, Harriet Iolani Makekau, which was resplendent [ohuohu Halemano i ka lau lehua] and attended by many [lei Kohala i ka nuku na kanaka]. Also present were Mr. and Mrs. Lane, friends, acquaintances, and others who attended. I took a look and felt much aloha for the kupuna who passed on when I saw the decorated lauhala bowls [umeke lauhala i kinohinohiia], the ti leaf vessels [pa holowaa la-i], and so forth; the knowledge of the ancestors handed down to this lady will be passed on to your grandchildren. [This little girl grows up to be one of the most famous of hula practitioners and teachers of our time. Ka Nupepa Kuokoa, Buke LIV, Helu 8, Aoao 6. Feberuari 25, 1916. This entry was posted in Birthday, Hula, Olelo Noeau and tagged "Lei Kohala i ka nuku na kanaka. ", Harriet Iolani Makekau, Iolani Luahine, Julia N. Luahine, Ohuohu Halemano i ka lau lehua by nupepa. Bookmark the permalink.